I'll admit it. Some mornings I wake up and crave dessert rather than breakfast. As much as I love great breakfast recipes like this Easy Cinnamon Roll recipe or this French Toast Roll Ups recipe, sometimes I really just want something to satisfy my sweet tooth. 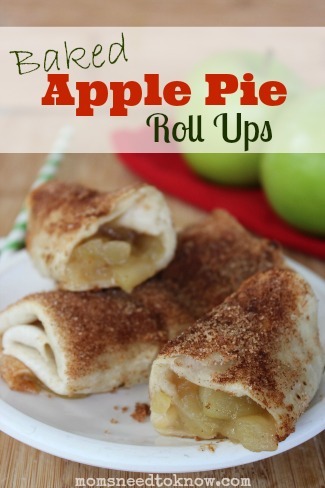 Today's Baked Apple Pie Roll Ups recipe fits the bill perfectly! It's yummy enough to be a dessert, but it's also healthy and filling enough that you can get away with having it for breakfast as well. Now, this Baked Apple Pie Roll Ups recipe isn't a quick weekday breakfast–it does take a little time both on the stove and in the oven. But if you have a weekend or holiday morning when you want to make a breakfast that is truly special, this recipe is perfect. The outsides get brown and slightly crispy while the insides are warm and gooey, similar to the apples in this Fried Apples recipe. When the tastes and textures come together in warm, gooey goodness, trust me–your body will think you are having dessert, not breakfast. Another great thing about this recipe is that it is made up of ingredients that you probably have on hand pretty often. It doesn't have any strange ingredients you have to hunt for in the store or that you have to make a special trip for. They are all common ingredients that you are familiar with, which is what you should expect from a recipe that is so similar to America's favorite dessert, apple pie. If you have a sweet tooth like I do, these Baked Apple Pie Roll Ups are one yummy breakfast you will definitely want to try! Core, peel and chop apples. Add the chopped apples, reduce heat and simmer 10 minutes (until the apples are tender). Microwave the tortillas for 30 seconds to make them more pliable for folding.